Egyptian Court Orders Release Of Former President Hosni Mubarak : The Two-Way Former President Hosni Mubarak could be freed from custody as soon as Thursday. The court ordered him to be freed as he appeals his conviction — and life sentence — for failing to stop the killing of protesters during the 2011 demonstrations that led to the toppling of his government. 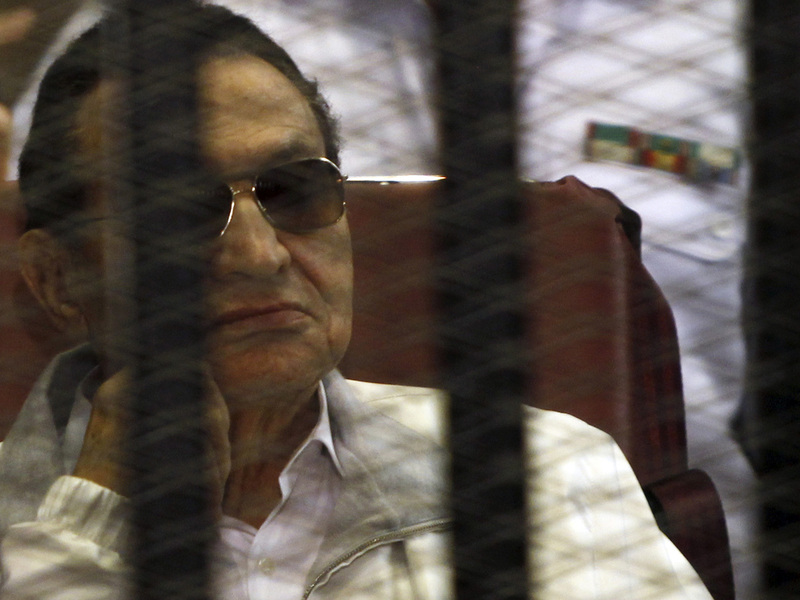 Former Egyptian President Hosni Mubarak sits in the dock during a June 8 court hearing in Cairo. An Egyptian court has ordered that former President Hosni Mubarak be released from custody while he awaits a retrial on charges related to the killing of protesters during the 2011 protests that led to the toppling of his government, NPR's Peter Kenyon reports from Cairo. Peter adds that even though that case and others related to corruption charges are still active, Mubarak's release would "likely spark anxiety that the military-backed government now in charge is returning Egypt to the authoritarian state it was in before the Arab Spring." Prosecutors, Peter also reports, have said they won't appeal the court's order. According to Reuters, the judge said prosecutors couldn't challenge the ruling even if they wished: "The decision to release Mubarak issued today ... is final and the prosecution cannot appeal against it," Judge Ahmed el-Bahrawi said. The BBC adds that reports from Cairo suggest Mubarak may be released as soon as Thursday. Mubarak, 85, was convicted last year and sentenced to life in prison for not stopping the killing of protesters in 2011. But the court has now said he should not be kept in custody while appealing that verdict.